For the EP by Nerina Pallot, see Buckminster Fuller (EP). Richard Buckminster Fuller (/ˈfʊlər/; July 12, 1895 – July 1, 1983) was an American architect, systems theorist, author, designer, inventor and futurist. Fuller published more than 30 books, coining or popularizing terms such as "Spaceship Earth", "Dymaxion" house/car, ephemeralization, synergetic, and "tensegrity". He also developed numerous inventions, mainly architectural designs, and popularized the widely known geodesic dome. Carbon molecules known as fullerenes were later named by scientists for their structural and mathematical resemblance to geodesic spheres. Fuller was the second World President of Mensa from 1974 to 1983. Fuller was born on July 12, 1895, in Milton, Massachusetts, the son of Richard Buckminster Fuller and Caroline Wolcott Andrews, and grand-nephew of Margaret Fuller, an American journalist, critic, and women's rights advocate associated with the American transcendentalism movement. The unusual middle name, Buckminster, was an ancestral family name. As a child, Richard Buckminster Fuller tried numerous variations of his name. He used to sign his name differently each year in the guest register of his family summer vacation home at Bear Island, Maine. He finally settled on R. Buckminster Fuller. Fuller spent much of his youth on Bear Island, in Penobscot Bay off the coast of Maine. He attended Froebelian Kindergarten. He disagreed with the way geometry was taught in school, being unable to experience for himself that a chalk dot on the blackboard represented an "empty" mathematical point, or that a line could stretch off to infinity. To him these were illogical, and led to his work on synergetics. He often made items from materials he found in the woods, and sometimes made his own tools. He experimented with designing a new apparatus for human propulsion of small boats. By age 12, he had invented a 'push pull' system for propelling a rowboat by use of an inverted umbrella connected to the transom with a simple oar lock which allowed the user to face forward to point the boat toward its destination. Later in life, Fuller took exception to the term "invention". Fuller attended Milton Academy in Massachusetts, and after that began studying at Harvard College, where he was affiliated with Adams House. He was expelled from Harvard twice: first for spending all his money partying with a vaudeville troupe, and then, after having been readmitted, for his "irresponsibility and lack of interest". By his own appraisal, he was a non-conforming misfit in the fraternity environment. Between his sessions at Harvard, Fuller worked in Canada as a mechanic in a textile mill, and later as a laborer in the meat-packing industry. He also served in the U.S. Navy in World War I, as a shipboard radio operator, as an editor of a publication, and as a crash rescue boat commander. After discharge, he worked again in the meat packing industry, acquiring management experience. In 1917, he married Anne Hewlett. During the early 1920s, he and his father-in-law developed the Stockade Building System for producing light-weight, weatherproof, and fireproof housing—although the company would ultimately fail in 1927. Buckminster Fuller recalled 1927 as a pivotal year of his life. His daughter Alexandra had died in 1922 of complications from polio and spinal meningitis just before her fourth birthday. Stanford historian, Barry Katz, found signs that around this time in his life Fuller was suffering from depression and anxiety. Fuller dwelled on his daughter's death, suspecting that it was connected with the Fullers' damp and drafty living conditions. This provided motivation for Fuller's involvement in Stockade Building Systems, a business which aimed to provide affordable, efficient housing. In 1927, at age 32, Fuller lost his job as president of Stockade. The Fuller family had no savings, and the birth of their daughter Allegra in 1927 added to the financial challenges. Fuller drank heavily and reflected upon the solution to his family's struggles on long walks around Chicago. During the autumn of 1927, Fuller contemplated suicide by drowning in Lake Michigan, so that his family could benefit from a life insurance payment. From now on you need never await temporal attestation to your thought. You think the truth. You do not have the right to eliminate yourself. You do not belong to you. You belong to Universe. Your significance will remain forever obscure to you, but you may assume that you are fulfilling your role if you apply yourself to converting your experiences to the highest advantage of others. Fuller stated that this experience led to a profound re-examination of his life. He ultimately chose to embark on "an experiment, to find what a single individual could contribute to changing the world and benefiting all humanity". Speaking to audiences later in life, Fuller would regularly recount the story of his Lake Michigan experience, and its transformative impact on his life. Historians have been unable to identify direct evidence for this experience within the 1927 papers of Fuller's Chronofile archives, housed at Stanford University. Stanford historian Barry Katz suggests that the suicide story may be a myth which Fuller constructed later in life, to summarize this formative period of his career. In 1927 Fuller resolved to think independently which included a commitment to "the search for the principles governing the universe and help advance the evolution of humanity in accordance with them ... finding ways of doing more with less to the end that all people everywhere can have more and more". By 1928, Fuller was living in Greenwich Village and spending much of his time at the popular café Romany Marie's, where he had spent an evening in conversation with Marie and Eugene O'Neill several years earlier. Fuller accepted a job decorating the interior of the café in exchange for meals, giving informal lectures several times a week, and models of the Dymaxion house were exhibited at the café. Isamu Noguchi arrived during 1929—Constantin Brâncuși, an old friend of Marie's, had directed him there—and Noguchi and Fuller were soon collaborating on several projects, including the modeling of the Dymaxion car based on recent work by Aurel Persu. It was the beginning of their lifelong friendship. Fuller taught at Black Mountain College in North Carolina during the summers of 1948 and 1949, serving as its Summer Institute director in 1949. There, with the support of a group of professors and students, he began reinventing a project that would make him famous: the geodesic dome. Although the geodesic dome had been created 26 years earlier by Dr. Walther Bauersfeld, Fuller was awarded United States patents, even though he neglected to cite Bauersfeld's prior art in his patent applications. He is credited for popularizing this type of structure. One of his early models was first constructed in 1945 at Bennington College in Vermont, where he lectured often. In 1949, he erected his first geodesic dome building that could sustain its own weight with no practical limits. It was 4.3 meters (14 feet) in diameter and constructed of aluminium aircraft tubing and a vinyl-plastic skin, in the form of an icosahedron. To prove his design, Fuller suspended from the structure's framework several students who had helped him build it. The U.S. government recognized the importance of his work, and employed his firm Geodesics, Inc. in Raleigh, North Carolina to make small domes for the Marines. Within a few years, there were thousands of such domes around the world. 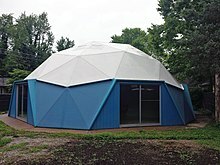 Fuller's first "continuous tension – discontinuous compression" geodesic dome (full sphere in this case) was constructed at the University of Oregon Architecture School in 1959 with the help of students. These continuous tension – discontinuous compression structures featured single force compression members (no flexure or bending moments) that did not touch each other and were 'suspended' by the tensional members. For half of a century, Fuller developed many ideas, designs and inventions, particularly regarding practical, inexpensive shelter and transportation. He documented his life, philosophy and ideas scrupulously by a daily diary (later called the Dymaxion Chronofile), and by twenty-eight publications. Fuller financed some of his experiments with inherited funds, sometimes augmented by funds invested by his collaborators, one example being the Dymaxion car project. 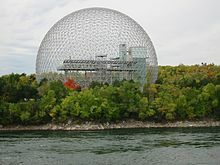 The Montreal Biosphère by Buckminster Fuller, 1967.
International recognition began with the success of huge geodesic domes during the 1950s. Fuller lectured at North Carolina State University in Raleigh in 1949, where he met James Fitzgibbon, who would become a close friend and colleague. Fitzgibbon was director of Geodesics, Inc. and Synergetics, Inc. the first licensees to design geodesic domes. Thomas C. Howard was lead designer, architect and engineer for both companies. Richard Lewontin, a new faculty member in population genetics at North Carolina State University, provided Fuller with computer calculations for the lengths of the domes' edges. Fuller began working with architect Shoji Sadao in 1954, and in 1964 they co-founded the architectural firm Fuller & Sadao Inc., whose first project was to design the large geodesic dome for the U.S. Pavilion at Expo 67 in Montreal. This building is now the "Montreal Biosphère". In 1962, the artist and searcher John McHale wrote the first monograph on Fuller, published by George Braziller in New York. From 1959 to 1970, Fuller taught at Southern Illinois University Carbondale (SIU). Beginning as an assistant professor, he gained full professorship in 1968, in the School of Art and Design. Working as a designer, scientist, developer, and writer, he lectured for many years around the world. He collaborated at SIU with John McHale. In 1965, they inaugurated the World Design Science Decade (1965 to 1975) at the meeting of the International Union of Architects in Paris, which was, in Fuller's own words, devoted to "applying the principles of science to solving the problems of humanity". Later in his SIU tenure, Fuller was also a visiting professor at SIU Edwardsville, where he designed the dome for the campus Religious Center. Fuller believed human societies would soon rely mainly on renewable sources of energy, such as solar- and wind-derived electricity. He hoped for an age of "omni-successful education and sustenance of all humanity". Fuller referred to himself as "the property of universe" and during one radio interview he gave later in life, declared himself and his work "the property of all humanity". For his lifetime of work, the American Humanist Association named him the 1969 Humanist of the Year. In 1976, Fuller was a key participant at UN Habitat I, the first UN forum on human settlements. Fuller was awarded 28 United States patents and many honorary doctorates. In 1960, he was awarded the Frank P. Brown Medal from The Franklin Institute. 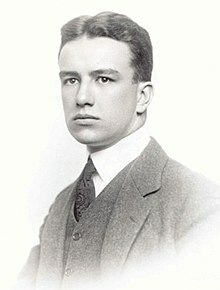 Fuller was elected as an honorary member of Phi Beta Kappa in 1967, on the occasion of the 50th year reunion of his Harvard class of 1917 (from which he was expelled in his first year). He was elected a Fellow of the American Academy of Arts and Sciences in 1968. In 1968, he was elected into the National Academy of Design as an Associate member, and became a full Academician in 1970. In 1970, he received the Gold Medal award from the American Institute of Architects. In 1976, he received the St. Louis Literary Award from the Saint Louis University Library Associates. He also received numerous other awards, including the Presidential Medal of Freedom presented to him on February 23, 1983, by President Ronald Reagan. Buckminster Fuller was a Unitarian, like his grandfather Arthur Buckminster Fuller, a Unitarian minister. Fuller was also an early environmental activist, aware of the Earth's finite resources, and promoted a principle he termed "ephemeralization", which, according to futurist and Fuller disciple Stewart Brand, was defined as "doing more with less". Resources and waste from crude, inefficient products could be recycled into making more valuable products, thus increasing the efficiency of the entire process. Fuller also coined the word synergetics, a catch-all term used broadly for communicating experiences using geometric concepts, and more specifically, the empirical study of systems in transformation; his focus was on total system behavior unpredicted by the behavior of any isolated components. Fuller was a pioneer in thinking globally, and explored energy and material efficiency in the fields of architecture, engineering and design. Citing François de Chardenèdes' opinion that petroleum, from the standpoint of its replacement cost in our current energy "budget" (essentially, the net incoming solar flux), had cost nature "over a million dollars" per U.S. gallon (US$300,000 per litre) to produce. From this point of view, its use as a transportation fuel by people commuting to work represents a huge net loss compared to their actual earnings. An encapsulation quotation of his views might best be summed up as: "There is no energy crisis, only a crisis of ignorance." Though Fuller was concerned about sustainability and human survival under the existing socio-economic system, he remained optimistic about humanity's future. Defining wealth in terms of knowledge, as the "technological ability to protect, nurture, support, and accommodate all growth needs of life," his analysis of the condition of "Spaceship Earth" caused him to conclude that at a certain time during the 1970s, humanity had attained an unprecedented state. He was convinced that the accumulation of relevant knowledge, combined with the quantities of major recyclable resources that had already been extracted from the earth, had attained a critical level, such that competition for necessities had become unnecessary. Cooperation had become the optimum survival strategy. He declared: "selfishness is unnecessary and hence-forth unrationalizable ... War is obsolete." He criticized previous utopian schemes as too exclusive, and thought this was a major source of their failure. To work, he thought that a utopia needed to include everyone. Fuller was influenced by Alfred Korzybski's idea of general semantics. In the 1950s, Fuller attended seminars and workshops organized by the Institute of General Semantics, and he delivered the annual Alfred Korzybski Memorial Lecture in 1955. Korzybski is mentioned in the Introduction of his book Synergetics. The two shared a remarkable amount of similarity in their formulations of general semantics. In his 1970 book I Seem To Be a Verb, he wrote: "I live on Earth at present, and I don't know what I am. I know that I am not a category. I am not a thing—a noun. I seem to be a verb, an evolutionary process—an integral function of the universe." Fuller wrote that the natural analytic geometry of the universe was based on arrays of tetrahedra. He developed this in several ways, from the close-packing of spheres and the number of compressive or tensile members required to stabilize an object in space. One confirming result was that the strongest possible homogeneous truss is cyclically tetrahedral. Fuller was most famous for his lattice shell structures – geodesic domes, which have been used as parts of military radar stations, civic buildings, environmental protest camps and exhibition attractions. An examination of the geodesic design by Walther Bauersfeld for the Zeiss-Planetarium, built some 28 years prior to Fuller's work, reveals that Fuller's Geodesic Dome patent (U.S. 2,682,235; awarded in 1954) is the same design as Bauersfeld's. Their construction is based on extending some basic principles to build simple "tensegrity" structures (tetrahedron, octahedron, and the closest packing of spheres), making them lightweight and stable. The geodesic dome was a result of Fuller's exploration of nature's constructing principles to find design solutions. The Fuller Dome is referenced in the Hugo Award-winning novel Stand on Zanzibar by John Brunner, in which a geodesic dome is said to cover the entire island of Manhattan, and it floats on air due to the hot-air balloon effect of the large air-mass under the dome (and perhaps its construction of lightweight materials). With such a vehicle at our disposal, [Fuller] felt that human travel, like that of birds, would no longer be confined to airports, roads, and other bureaucratic boundaries, and that autonomous free-thinking human beings could live and prosper wherever they chose. 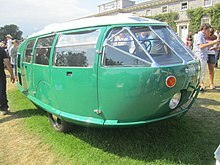 Fuller described the Dymaxion as a "zoom-mobile, explaining that it could hop off the road at will, fly about, then, as deftly as a bird, settle back into a place in traffic". The Dymaxion car, c.1933, artist Diego Rivera shown entering the car, carrying coat. The Dymaxion car was a vehicle designed by Fuller, featured prominently at Chicago's 1933-1934 Century of Progress World's Fair. During the Great Depression, Fuller formed the Dymaxion Corporation and built three prototypes with noted naval architect Starling Burgess and a team of 27 workmen — using donated money as well as a family inheritance. Fuller associated the word Dymaxion with much of his work, a portmanteau of the words dynamic, maximum, and tension to sum up the goal of his study, "maximum gain of advantage from minimal energy input". The Dymaxion was not an automobile per se, but rather the 'ground-taxying mode' of a vehicle that might one day be designed to fly, land and drive — an "Omni-Medium Transport" for air, land and water. Fuller focused on the landing and taxiing qualities, and noted severe limitations in its handling. The team made constant improvements and refinements to the platform, and Fuller noted the Dymaxion "was an invention that could not be made available to the general public without considerable improvements". The bodywork was aerodynamically designed for increased fuel efficiency and speed as well as light weight, and its platform featured a lightweight cromoly-steel hinged chassis, rear-mounted V8 engine, front-drive and three-wheels. The vehicle was steered via the third wheel at the rear, capable of 90° steering lock. Thus able to steer in a tight circle, the Dymaxion often caused a sensation, bringing nearby traffic to a halt. Shortly after launch, a prototype crashed after being hit by another car, killing the Dymaxion's driver. The other car was driven by a local politician and was illegally removed from the accident scene, leaving reporters who arrived subsequently to blame the Dymaxion's unconventional design — though investigations exonerated the prototype. Fuller would himself later crash another prototype with his young daughter aboard. Despite courting the interest of important figures from the auto industry, Fuller used his family inheritance to finish the second and third prototypes — eventually selling all three, dissolving Dymaxion Corporation and maintaining the Dymaxion was never intended as a commercial venture. One of the three original prototypes survives. Fuller's energy-efficient and inexpensive Dymaxion house garnered much interest, but only two prototypes were ever produced. Here the term "Dymaxion" is used in effect to signify a "radically strong and light tensegrity structure". One of Fuller's Dymaxion Houses is on display as a permanent exhibit at the Henry Ford Museum in Dearborn, Michigan. Designed and developed during the mid-1940s, this prototype is a round structure (not a dome), shaped something like the flattened "bell" of certain jellyfish. It has several innovative features, including revolving dresser drawers, and a fine-mist shower that reduces water consumption. According to Fuller biographer Steve Crooks, the house was designed to be delivered in two cylindrical packages, with interior color panels available at local dealers. A circular structure at the top of the house was designed to rotate around a central mast to use natural winds for cooling and air circulation. Conceived nearly two decades earlier, and developed in Wichita, Kansas, the house was designed to be lightweight, adapted to windy climates, cheap to produce and easy to assemble. Because of its light weight and portability, the Dymaxion House was intended to be the ideal housing for individuals and families who wanted the option of easy mobility. The design included a "Go-Ahead-With-Life Room" stocked with maps, charts, and helpful tools for travel "through time and space". It was to be produced using factories, workers, and technologies that had produced World War II aircraft. It looked ultramodern at the time, built of metal, and sheathed in polished aluminum. The basic model enclosed 90 m2 (970 sq ft) of floor area. Due to publicity, there were many orders during the early Post-War years, but the company that Fuller and others had formed to produce the houses failed due to management problems. In 1967, Fuller developed a concept for an offshore floating city named Triton City and published a report on the design the following year. Models of the city aroused the interest of President Lyndon B. Johnson who, after leaving office, had them placed in the Lyndon Baines Johnson Library and Museum. In 1969, Fuller began the Otisco Project, named after its location in Otisco, New York. The project developed and demonstrated concrete spray with mesh-covered wireforms for producing large-scale, load-bearing spanning structures built on-site, without the use of pouring molds, other adjacent surfaces or hoisting. The initial method used a circular concrete footing in which anchor posts were set. Tubes cut to length and with ends flattened were then bolted together to form a duodeca-rhombicahedron (22-sided hemisphere) geodesic structure with spans ranging to 60 feet (18 m). The form was then draped with layers of ¼-inch wire mesh attached by twist ties. Concrete was sprayed onto the structure, building up a solid layer which, when cured, would support additional concrete to be added by a variety of traditional means. Fuller referred to these buildings as monolithic ferroconcrete geodesic domes. However, the tubular frame form proved problematic for setting windows and doors. It was replaced by an iron rebar set vertically in the concrete footing and then bent inward and welded in place to create the dome's wireform structure and performed satisfactorily. Domes up to three stories tall built with this method proved to be remarkably strong. Other shapes such as cones, pyramids and arches proved equally adaptable. The project was enabled by a grant underwritten by Syracuse University and sponsored by U.S. Steel (rebar), the Johnson Wire Corp, (mesh) and Portland Cement Company (concrete). The ability to build large complex load bearing concrete spanning structures in free space would open many possibilities in architecture, and is considered as one of Fuller's greatest contributions. Fuller, along with co-cartographer Shoji Sadao, also designed an alternative projection map, called the Dymaxion map. This was designed to show Earth's continents with minimum distortion when projected or printed on a flat surface. In the 1960s, Fuller developed the World Game, a collaborative simulation game played on a 70-by-35-foot Dymaxion map, in which players attempt to solve world problems. The object of the simulation game is, in Fuller's words, to "make the world work, for 100% of humanity, in the shortest possible time, through spontaneous cooperation, without ecological offense or the disadvantage of anyone". In the 1920s, Fuller experimented with polyphasic sleep, which he called Dymaxion sleep. Inspired by the sleep habits of animals such as dogs and cats,:133 Fuller worked until he was tired, and then slept short naps. This generally resulted in Fuller sleeping 30-minute naps every 6 hours. :160 This allowed him "twenty-two thinking hours a day", which aided his work productivity. :160 Fuller reportedly kept this Dymaxion sleep habit for two years, before quitting the routine because it conflicted with his business associates' sleep habits. Despite no longer personally partaking in the habit, in 1943 Fuller suggested Dymaxion sleep as a strategy that the United States could adopt to win World War II. Fuller documented his life copiously from 1915 to 1983, approximately 270 feet (82 m) of papers in a collection called the Dymaxion Chronofile. He also kept copies of all incoming and outgoing correspondence. The enormous Fuller Collection is currently housed at Stanford University. If somebody kept a very accurate record of a human being, going through the era from the Gay 90s, from a very different kind of world through the turn of the century—as far into the twentieth century as you might live. I decided to make myself a good case history of such a human being and it meant that I could not be judge of what was valid to put in or not. I must put everything in, so I started a very rigorous record. In his youth, Fuller experimented with several ways of presenting himself: R. B. Fuller, Buckminster Fuller, but as an adult finally settled on R. Buckminster Fuller, and signed his letters as such. 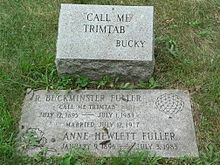 However, he preferred to be addressed as simply "Bucky". Fuller used the word Universe without the definite or indefinite articles (the or a) and always capitalized the word. Fuller wrote that "by Universe I mean: the aggregate of all humanity's consciously apprehended and communicated (to self or others) Experiences". The words "down" and "up", according to Fuller, are awkward in that they refer to a planar concept of direction inconsistent with human experience. The words "in" and "out" should be used instead, he argued, because they better describe an object's relation to a gravitational center, the Earth. "I suggest to audiences that they say, 'I'm going "outstairs" and "instairs."' At first that sounds strange to them; They all laugh about it. But if they try saying in and out for a few days in fun, they find themselves beginning to realize that they are indeed going inward and outward in respect to the center of Earth, which is our Spaceship Earth. And for the first time they begin to feel real 'reality.'" "World-around" is a term coined by Fuller to replace "worldwide". The general belief in a flat Earth died out in classical antiquity, so using "wide" is an anachronism when referring to the surface of the Earth—a spheroidal surface has area and encloses a volume but has no width. Fuller held that unthinking use of obsolete scientific ideas detracts from and misleads intuition. Other neologisms collectively invented by the Fuller family, according to Allegra Fuller Snyder, are the terms "sunsight" and "sunclipse", replacing "sunrise" and "sunset" to overturn the geocentric bias of most pre-Copernican celestial mechanics. Fuller also invented the word "livingry," as opposed to weaponry (or "killingry"), to mean that which is in support of all human, plant, and Earth life. "The architectural profession—civil, naval, aeronautical, and astronautical—has always been the place where the most competent thinking is conducted regarding livingry, as opposed to weaponry." "Dymaxion" is a portmanteau of "dynamic maximum tension". It was invented about 1929 by two admen at Marshall Field's department store in Chicago to describe Fuller's concept house, which was shown as part of a house of the future store display. They created the term utilizing three words that Fuller used repeatedly to describe his design – dynamic, maximum, and tension. Fuller also helped to popularize the concept of Spaceship Earth: "The most important fact about Spaceship Earth: an instruction manual didn't come with it." Buckminsterfullerene is a type of fullerene with the formula C60. The names are homages to Buckminster Fuller, whose geodesic domes they resemble. Among the many people who were influenced by Buckminster Fuller are: Constance Abernathy,Ruth Asawa,J. Baldwin,Michael Ben-Eli,Pierre Cabrol,John Cage, Joseph Clinton,Peter Floyd,Medard Gabel,Michael Hays,David Johnston,Peter Jon Pearce,Shoji Sadao,Edwin Schlossberg,Kenneth Snelson,Robert Anton Wilson and Stewart Brand. An allotrope of carbon, fullerene—and a particular molecule of that allotrope C60 (buckminsterfullerene or buckyball) has been named after him. The Buckminsterfullerene molecule, which consists of 60 carbon atoms, very closely resembles a spherical version of Fuller's geodesic dome. The 1996 Nobel prize in chemistry was given to Kroto, Curl, and Smalley for their discovery of the fullerene. He is quoted in the lyric of "The Tower of Babble" in the[when?] musical Godspell: "Man is a complex of patterns and processes." The indie band Driftless Pony Club named their 2011 album, Buckminster, after him. All the songs within the album are based upon his life and works. On July 12, 2004, the United States Post Office released a new commemorative stamp honoring R. Buckminster Fuller on the 50th anniversary of his patent for the geodesic dome and by the occasion of his 109th birthday. The stamp's design replicated the January 10, 1964 cover of Time Magazine. 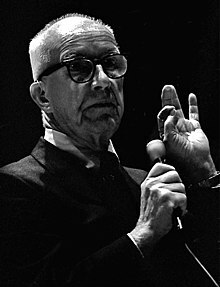 Fuller was the subject of two documentary films: The World of Buckminster Fuller (1971) and Buckminster Fuller: Thinking Out Loud (1996). Additionally, filmmaker Sam Green and the band Yo La Tengo collaborated on a 2012 "live documentary" about Fuller, The Love Song of R. Buckminster Fuller. In June 2008, the Whitney Museum of American Art presented "Buckminster Fuller: Starting with the Universe", the most comprehensive retrospective to date of his work and ideas. The exhibition traveled to the Museum of Contemporary Art, Chicago in 2009. It presented a combination of models, sketches, and other artifacts, representing six decades of the artist's integrated approach to housing, transportation, communication, and cartography. It also featured the extensive connections with Chicago from his years spent living, teaching, and working in the city. In 2009, a number of US companies decided to repackage spherical magnets and sell them as toys. One company, Maxfield & Oberton, told The New York Times that they saw the product on YouTube and decided to repackage them as "Buckyballs", because the magnets could self-form and hold together in shapes reminiscent of the Fuller inspired buckyballs. The buckyball toy launched at New York International Gift Fair in 2009 and sold in the hundreds of thousands, but by 2010 began to experience problems with toy safety issues and the company was forced to recall the packages that were labelled as toys. Robert Kiyosaki's 2015 book Second Chance is largely about Kiyosaki's interactions with Fuller, and Fuller's unusual final book Grunch of Giants. In 2012, the San Francisco Museum of Modern Art hosted "The Utopian Impulse" – a show about Buckminster Fuller's influence in the Bay Area. Featured were concepts, inventions and designs for creating "free energy" from natural forces, and for sequestering carbon from the atmosphere. The show ran January through July. In a different note, Fuller's quote "Those who play with the Devil's toys, will be brought by degree to wield his sword" was used and referenced as the first display seen in the strategy sci-fi video game XCOM: Enemy Within developed by Firaxis Games. The House of Tomorrow, is a 2017 American independent drama film written and directed by Peter Livolsi, based on Peter Bognanni's 2010 novel of the same name, featuring Asa Butterfield, Alex Wolff, Nick Offerman, Maude Apatow, and Ellen Burstyn. Burstyn's character is obsessed by all things Buckminster Fuller providing retro-futurist tours of her geodesic home, including authentic video of Buckminster Fuller talking and sailing with Ellen Burstyn, who'd actually befriended him in real life. ^ Encyclopædia Britannica. (2007). "Fuller, R. Buckminster". Encyclopædia Britannica Online. Archived from the original on October 21, 2007. Retrieved April 20, 2007. ^ Serebriakoff, Victor (1986). Mensa: The Society for the Highly Intelligent. Stein and Day. pp. 299, 304. ISBN 978-0-8128-3091-0. ^ Staff (2010). "The History of Mensa: Chapter 1: The Early Years (1945-1953)". Mensa Switzerland. Archived from the original on March 8, 2019. Retrieved March 8, 2019. ^ Fuller, Buckminster (1983). Inventions, The Patented Works of R. Buckminster Fuller. St. Martin's Press. pp. vii. ^ Sieden, Steven (2000). Buckminster Fuller's Universe: His Life and Work. ISBN 978-0738203799. ^ a b c Pawley, Martin (1991). Buckminster Fuller. New York: Taplinger. ISBN 978-0-8008-1116-7. ^ Sieden, Lloyd Steven (2000). Buckminster Fuller's Universe: His Life and Work. New York: Perseus Books Group. pp. 84–85. ISBN 978-0-7382-0379-9. However, in 1927 his own financial difficulties forced Mr. Hewlett to sell his stock in the company. Within weeks Stockade Building Systems became a subsidiary of Celotex Corporation, whose primary motivation was akin to that of other conventional companies: making a profit. Celotex management took one look at Stockade's financial records and called for a complete overhaul of the company. The first casualty of the transition was Stockade's controversial president [Buckminster Fuller, who was fired]. ^ a b c d e Sieden, Lloyd Steven (1989). Buckminster Fuller's Universe: His Life and Work. Basic Books. ISBN 978-0-7382-0379-9. ^ James Sterngold (June 15, 2008). "The Love Song of R. Buckminster Fuller". The New York Times. Retrieved January 24, 2019. ^ Sieden, Lloyd Steven (1989). Buckminster Fuller's Universe: His Life and Work. Basic Books. p. 87. ISBN 978-0-7382-0379-9. ... during 1927, Bucky found himself unemployed with a new daughter to support as winter was approaching. With no steady income the Fuller family was living beyond its means and falling further and further into debt. Searching for solace and escape, Bucky continued drinking and carousing. He also tended to wander aimlessly through the Chicago streets pondering his situation. It was during one such walk that he ventured down to the shore of Lake Michigan on a particularly cold autumn evening and seriously contemplated swimming out until he was exhausted and ending his life. ^ Sieden, Lloyd Steven (1989). Buckminster Fuller's Universe: His Life and Work. Basic Books. pp. 87–88. ISBN 978-0-7382-0379-9. ^ Sterngold, James (June 15, 2008). "The Love Song of R. Buckminster Fuller". The New York Times. Retrieved July 28, 2013. ^ a b c Haber, John. "Before Buckyballs". Review of Noguchi Museum Best of Friends exhibit (May 19, 2006 – October 15, 2006). Noguchi, then twenty-five, had already had enough influences for a lifetime — from birth in Los Angeles, to childhood in Japan and the Midwest, to premedical classes at Columbia, to academic sculpture on the Lower East Side, to Brancusi's circle in Paris. Now his exposure to Modernism and "the American century" received a decidedly New York influence. See also: Glueck, Grace (May 19, 2006). "The Architect and the Sculptor: A Friendship of Ideas". The New York Times. Retrieved April 27, 2010. ^ a b Lloyd Steven Sieden. Buckminster Fuller's Universe: His Life and Work (pp. 74, 119–142). New York: Perseus Books Group, 2000. ISBN 0-7382-0379-3. p. 74: "Although O'Neill soon became well known as a major American playwright, it was Romany Marie who would significantly influence Bucky, becoming his close friend and confidante during the most difficult years of his life." ^ a b Haskell, John. "Buckminster Fuller and Isamu Noguchi". Kraine Gallery Bar Lit, Fall 2007. Archived from the original on May 13, 2008. Retrieved 2014-04-18. ^ Schulman, Robert (2006). Romany Marie: The Queen of Greenwich Village. Louisville: Butler Books. pp. 85–86, 109–110. ISBN 978-1-884532-74-0. ^ "Interview with Isamu Noguchi conducted by Paul Cummings at Noguchi's studio in Long Island City, Queens". Smithsonian Archives of American Art. November 7, 1973. ^ Gorman, Michael John (March 12, 2002). "Passenger Files: Isamu Noguchi, 1904–1988". Towards a cultural history of Buckminster Fuller's Dymaxion Car. Stanford Humanities Lab. Archived from the original on June 13, 2007. Includes several images. ^ "IDEAS + INVENTIONS: Buckminster Fuller and Black Mountain College, July 15 – November 26, 2005". Black Mountain College Museum and Arts Center. 2005. Archived from the original on January 15, 2009. ^ Marks, Robert W.; Fuller, R. Buckminster (1973). The Dymaxion world of Buckminster Fuller. Garden City, N.Y.: Anchor Books. ISBN 978-0-385-01804-3. ^ Jerry Coyne and Steve Jones (1995). "1994 Sewall Wright Award: Richard C. Lewontin". The American Naturalist. 146 (1). University of Chicago Press. pp. front matter. ^ a b "Shoji Sadao". World Resource Simulation Center. 2016. Retrieved January 11, 2016. ^ "The Center for Spirituality & Sustainability". Siue.edu. Archived from the original on March 13, 2013. Retrieved October 28, 2012. ^ "Partial list of Fuller U.S. patents". Retrieved April 18, 2014. ^ "Catalogue of Members: Harvard members elected from 1966-1981" (PDF). Harvard College Phi Beta Kappa. Retrieved January 31, 2015. ^ Sieden, L. Steven (2011). "Biography of R. Buckminster Fuller - Section 4: 1947–1976". BuckyFullerNow.com. Retrieved January 31, 2015. ^ "Book of Members, 1780–2010: Chapter F" (PDF). American Academy of Arts and Sciences. Retrieved April 7, 2011. ^ Saint Louis University Library Associates. "Recipients of the Saint Louis Literary Award". Archived from the original on July 31, 2016. Retrieved July 25, 2016. ^ "Arthur Buckminster Fuller". Archived from the original on October 19, 2006. ^ "Buckminster Fuller: Designer of a New World, 1895-1983". Harvard Square Library. 2016. Archived from the original on August 6, 2013. Retrieved January 11, 2016. ^ Brand, Stewart (1999). The Clock of the Long Now. New York: Basic. ISBN 978-0-465-04512-9. ^ Fuller, R. Buckminster (1969). Operating Manual for Spaceship Earth. Carbondale, IL: Southern Illinois University Press. ISBN 978-0-8093-2461-3. ^ Fuller, R. Buckminster; Applewhite, E. J. (1975). Synergetics. New York: Macmillan. ISBN 978-0-02-541870-7. ^ Fuller, R. Buckminster (1981). Critical Path. New York: St. Martin's Press. xxxiv–xxxv. ISBN 978-0-312-17488-0. ^ Ament, Phil. "Inventor R. Buckminster Fuller". Ideafinder.com. Retrieved October 28, 2012. ^ "Buckminster Fuller World Game Synergy Anticapatory". YouTube. January 27, 2007. Retrieved October 28, 2012. ^ "The Debates". The Economist. ^ Fuller, R. Buckminster (1981). "Introduction". Critical Path (1st ed.). New York, N.Y.: St.Martin's Press. xxv. ISBN 978-0-312-17488-0. "It no longer has to be you or me. Selfishness is unnecessary and hence-forth unrationalizable as mandated by survival. War is obsolete. ^ Fuller, R. Buckminster (2008). Snyder, Jaime (ed.). Utopia or oblivion: the prospects for humanity. Baden, Switzerland: Lars Müller Publishers. ISBN 978-3-03778-127-2. ^ "Notable Individuals Influenced by General Semantics". The Institute of General Semantics. Retrieved April 18, 2014. ^ Drake, Harold L. "The General Semantics and Science Fiction of Robert heinlein and A. E. Van Vogt" (PDF). General Semantics Bulletin 41. Institute of General Semantics. p. 144. For his dissertation showing some relationships between formulations of Alfred Korzybski and Buckminster Fuller, plus documenting meetings and associations of the two gentlemen, he was given the 1973 Irving J. Lee Award in General Semantics offered by the International Society for General Semantics. ^ "Geodesic Domes and Charts of the Heavens". Telacommunications.com. June 19, 1973. Retrieved April 18, 2014. ^ "The R. Buckminster Fuller FAQ: Geodesic Domes". Cjfearnley.com. Retrieved April 18, 2014. ^ a b c Lloyd Steven Sieden (August 11, 2000). Buckminster Fuller's Universe. Basic Books. ISBN 9780738203799. ^ "R. (Richard) Buckminster Fuller 1895-1983". Coachbuilt.com. ^ Frank Magill (1999). The 20th Century A-GI: Dictionary of World Biography, Volume 7. Routledge. p. 1266. ISBN 978-1136593345. ^ Phil Patton (June 2, 2008). "A 3-Wheel Dream That Died at Takeoff". The New York Times. ^ Sieden, Lloyd Steven (2000). Buckminster Fuller's Universe. Basic Books. p. 132. ISBN 978-0-7382-0379-9. ^ McHale, John (1962). R. Buckminster Fuller. Prentice-Hall. p. 17. ^ Marks, Robert (1973). The Dymaxion World of Buckminster Fuller. Anchor Press / Doubleday. p. 104. ^ Art Kleiner (April 2008). The Age of Heretics. Jossey Bass, Warren Bennis Signature Series. ISBN 9780470443415. In 1934, Fuller had interested auto magnate Walter Chrysler in financing his Dymaxion car, a durable, three-wheeled, aerodynamic land vehicle modeled after an airplane fuselage. Fuller had built three models that drew enthusiastic crowds wherever. Like all Fuller's other projects (he was responsible for refining and developing the geodesic dome, the first practical dome structure) it was inexpensive, durable and energy efficient; Fuller worked diligently to cut back the amount of material and energy used by any product he designed. "You've produced exactly the car I've always wanted to produce," the mechanically apt Chrysler told him. Then Chrysler noted ruefully, Fuller had taken one-third the time and one fourth the money Chrysler's corporation usually spent producing prototypes — prototypes Chrysler himself usually hated in the end. For a few months, it had seemed Chrysler would go ahead and introduce Fuller's car. But the banks that financed Chrysler's wholesale distributors vetoed the move by threatening to call in their loans. The bankers were afraid (or so Fuller said years later) that an advanced new design would diminish the value of the unsold motor vehicles in dealers' showrooms. For every new car sold, five used cars had to be sold to finance the distribution and production chain, and those cars would not sell if Fuller's invention made them obsolete. ^ Marks, Robert (1973). The Dymaxion World of Buckminster Fuller. Anchor Press / Doubleday. p. 29. ^ a b "Passenger Files: Francis T. Turner, Colonel William Francis Forbes-Sempill and Charles Dollfuss". Stanford University Archives. Archived from the original on August 21, 2012. ^ Davey G. Johnson (March 18, 2015). "Maximum Dynamism! Jeff Lane's Fuller Dymaxion Replica Captures Insane Cool of the Originals". Car and Driver. ^ R. Buckminster Fuller (1983). Inventions: The Patented Works of R. Buckminster Fuller. St. Martin's Press. ^ "About Fuller, Session 9, Part 15". Bucky Fuller Institute. ^ Massey, Jonathan (2012). "Buckminster Fuller's Reflexive Modernism". Design and Culture. 4 (3): 325–344. doi:10.2752/175470812X13361292229159. ^ Wigley, M (1997). "Planetary Homeboy". Any. pp. 16–23. ^ R. Buckminster Fuller (1968). A study of a prototype floating community. Triton Foundation. ^ Lear, John (December 4, 1971). "Cities on the Sea?". The Saturday Review. 54: 90. Retrieved January 11, 2016. ^ Perry, Tony (October 2, 1995). "This Game Anything but Child's Play: Buckminster Fuller's creation aims to fight the real enemies of mankind: starvation, disease and illiteracy". The Los Angeles Times. Retrieved January 19, 2014. ^ Richards, Allen (May – June 1971). "R. Buckminster Fuller: Designer of the Geodesic Dome and the World Game". Mother Earth News. Retrieved January 19, 2014. ^ Aigner, Hal (November – December 1970). "Sustaining Planet Earth: Researching World Resources". Mother Earth News. Retrieved January 19, 2014. ^ "World Game". Buckminster Fuller Institute. Retrieved January 19, 2014. ^ a b Tomkins, Calvin (January 8, 1966). "In the Outlaw Area". The New Yorker. Retrieved December 14, 2015. ^ a b c d e f Kenner, Hugh (1973). Bucky: A Guided Tour of Buckminster Fuller. New York: William Morrow & Company. ISBN 978-0-688-00141-4. ^ a b c "Buckminster Fuller and Maharishi Mahesh Yogi Part One of Press Conference 1/3". YouTube. Retrieved December 14, 2015. ^ Questioning Minds: The Letters of Guy Davenport and Hugh Kenner, ed. Edward M. Burns (Counterpoint, 2018), p. 733. ^ Kolbert, Elizabeth. "Annals of Innovation: Dymaxion Man: Reporting & Essays". The New Yorker. Retrieved April 18, 2014. ^ Fuller, Buckminster (1969). Operating Manual for Spaceship Earth. Carbondale: Southern Illinois University Press. ISBN 978-0-8093-2461-3. ^ Sieden, Lloyd Steven (2000). Buckminster Fuller's Universe: His Life and Work. New York: Perseus Books Group. ISBN 978-0-7382-0379-9. ^ a b "Science: Dymaxion Sleep". Time. October 11, 1943. Retrieved April 27, 2010. ^ "Buckminster Fuller conversations". News-service.stanford.edu. January 22, 2003. Retrieved April 18, 2014. ^ "Stanford University Libraries & Academic Information Resources". Sul.stanford.edu. June 22, 2005. Retrieved October 28, 2012. ^ He wrote a single unpunctuated sentence approximately 3000 words long titled "What I Am Trying to Do." And It Came to Pass – Not to Stay Macmillan Publishing, New York, 1976. ^ R. Buckminster Fuller – Autobiographical Monologue/Scenario,St. Martin's Press, Inc.,1980, page 54. ^ "In praise of Fuller: The Tokyo Tower that never was", Tokyo Global Engineering Corporation. ^ "Penang Story Lecture: KOMTAR and the Buckminster Fuller Connection", Penang Heritage Trust. ^ DeVarco, Bonnie Goldstein (2016). "Bucky Fuller: Life, Facts & Artifacts". thirteen.org. Retrieved January 11, 2016. ^ a b Zung, Thomas T. K. (March 20, 2002). Buckminster Fuller: Anthology for the New Millennium. St. Martin's Press. p. 201. ISBN 978-0-312-28890-7. ^ "BuckyWorks: Buckminster Fuller's Ideas for Today". thirteen.org. 2016. Retrieved January 11, 2016. ^ "Buckyworks - Buckminster Fuller's Ideas for Today by J. Baldwin". Buckminster Fuller Institute. 2004. Archived from the original on August 24, 2012. Retrieved January 11, 2016. ^ a b c d e f Makovsky, Paul. "The Fuller Effect". Retrieved November 21, 2013. ^ Noland, Claire (November 1, 2009). "Pierre Cabrol dies at 84; architect was lead designer of Hollywood's Cinerama Dome". Los Angeles Times. Archived from the original on December 10, 2009. Retrieved January 11, 2016. ^ "Chemistry 1996". Nobelprize.org. Retrieved April 18, 2014. ^ "Godspell: Prologue / Tower of Babble Lyrics". allmusicals.com. 2016. Retrieved January 11, 2016. ^ "Driftless Pony Club". Apple. Retrieved October 25, 2016. ^ "Chicago's MCA to show Buckminster Fuller ~ Starting with the Universe". Art Knowledge News. 2009. Archived from the original on April 7, 2010. Retrieved August 8, 2011. ^ Martin, Andrew (August 16, 2012). "For Buckyballs Toys, Child Safety Is a Growing Issue". The New York Times. ^ Buckyballs® High Powered Magnets Sets Recalled by Maxfield and Oberton Due to Violation of Federal Toy Standard, Consumer Product Safety Commission, May 27, 2010. Applewhite, E. J. (1977). Cosmic Fishing: An account of writing Synergetics with Buckminster Fuller. ISBN 978-0-02-502710-7. Applewhite, E. J., ed. (1986). Synergetics Dictionary, The Mind Of Buckminster Fuller; in four volumes. New York and London: Garland Publishing, Inc. ISBN 978-0-8240-8729-6. Chu, Hsiao-Yun (Fall 2008). "Fuller's Laboratory Notebook". Collections. 4 (4): 295–306. doi:10.1177/155019060800400404. Chu, Hsiao-Yun; Trujillo, Roberto (2009). New Views on R. Buckminster Fuller. Stanford, CA: Stanford University Press. ISBN 978-0-8047-6279-3. Eastham, Scott (2007). American Dreamer. Bucky Fuller and the Sacred Geometry of Nature. Cambridge: The Lutterworth Press. ISBN 978-0-7188-3031-1. Edmondson, Amy (2007). A Fuller Explanation. EmergentWorld LLC. ISBN 978-0-6151-8314-5. Hatch, Alden (1974). Buckminster Fuller At Home In The Universe. New York: Crown Publishers. ISBN 978-0-440-04408-6. Gorman, Michael John (2005). Buckminster Fuller: Designing for Mobility. Skira. ISBN 978-8876242656. Kenner, Hugh (1973). Bucky: a guided tour of Buckminster Fuller. ISBN 978-0-688-00141-4. McHale, John (1962). R. Buckminster Fuller. New York: George Brazillier, Inc.
Pawley, Martin (1991). Buckminster Fuller. New York: Taplinger Publishing Company. ISBN 978-0-8008-1116-7. Potter, R. Robert (1990). Buckminster Fuller. Pioneers in Change Series. Silver Burdett Publishers. ISBN 978-0-382-09972-4. Robertson, Donald (1974). Mind's Eye Of Buckminster Fuller. New York: Vantage Press, Inc. ISBN 978-0-533-01017-2. Snyder, Robert (1980). Buckminster Fuller: An Autobiographical Monologue/Scenario. New York: St. Martin's Press. ISBN 978-0-312-24547-4. Sterngold, James (June 15, 2008). "The Love Song of R. Buckminster Fuller". The New York Times (Arts section). Wong, Yunn Chii (1999). The Geodesic Works of Richard Buckminster Fuller, 1948–1968 (The Universe as a Home of Man) (PhD thesis). Cambridge, Massachusetts: Massachusetts Institute of Technology, Department of Architecture. hdl:1721.1/9512. Zung, Thomas T. K. (2001). Buckminster Fuller: Anthology for the New Millennium. St. Martin's Press. ISBN 978-0312266394. Wikimedia Commons has media related to Buckminster Fuller. Clara Thomas Archives and Special Collections, York University – Archival photographs of Buckminster Fuller from the Toronto Telegram. The Everything I Know 42-hour lecture session — video, audio, and full transcripts.